Aromatherapy can be beneficial to your horse. Watch your horse’s nostrils when you offer him a scent. My daughter and I make our own natural skin care and hair care products — we started because she didn’t want to keep putting chemicals on her skin. We started buying products at Lush, but the high prices made going natural painful (and the products didn’t always work so well for us) so I found a few recipes that work well for us. Our favorite home product is a Shea butter hair conditioner. It works better than any we’ve ever bought and it very simple to use (if you’re interested, I found the recipe here). I had made a batch for my farrier, who came today, and scented it with Jasmine and Sweet Orange essential oils. When I gave it to her, I took the top off of it so she could smell the scent and discovered that Freedom loved it! First he sniffed it with each nostril, then, when I’d put some on my hand, he started to lick it (luckily it’s made from all natural products!). I’ve read about using essential oils with horses — some people use them as part of massage therapy, some report that horses find certain scents to be calming, or they use them to treat skin irritations or wounds. I didn’t expect Freedom to have such a strong, positive reaction to the scents that I’d used and it makes me wonder if it would work in a base of jojoba or almond oil as a massage aid. Essential oils that are commonly used with horses include: chamomile for anxiety; lavender for stress, sore muscles or to relieve nervous tension; jasmine to lift mood and as an anti-spasmodic; orange for uplifting the spirit, calming and easing sore muscles;, peppermint for concentration and as a natural digestive aid; frankincense to stimulate the immune system and treat wounds. From what I’ve read, not all scents appeal to all horses so it’s best to let a horse show you which essential oils they prefer. Start by putting a couple of drops of the scent on your hand and offering it to your horse. If they are interested they will seek out the scent, nuzzle your hand and may even give a flehman response. Remember that essential oils can be highly concentrated so will smell especially strong to your horse. The blend that Freedom liked so much was part of a hair conditioner, so the oils had been diluted. When applying them directly to your horse’s skin, you should dilute essential oils in a carrier like coconut oil, jojoba oil, aloe vera gel, etc. Use essential oils, not perfume oils as the latter can contain a lot of solvents. I bought my essential oils mostly at Whole Foods so I can sniff them before I buy, but I also order them from Amazon. If the oil is safe to be ingested, and the horse is so inclined, you can let them lick the oil(s) from your hand. You can apply the oil to their forehead — the spot in between their eyes, under their forelock is called Yin Tang and it is an acupuncture calming spot. It can also be helpful to apply to the horse’s crest or at its poll. When offering aromatically watch to see which nostril the horse inhales with first this is a key to your horses emotions. Your horse may move one nostril over the bottle, then the other. 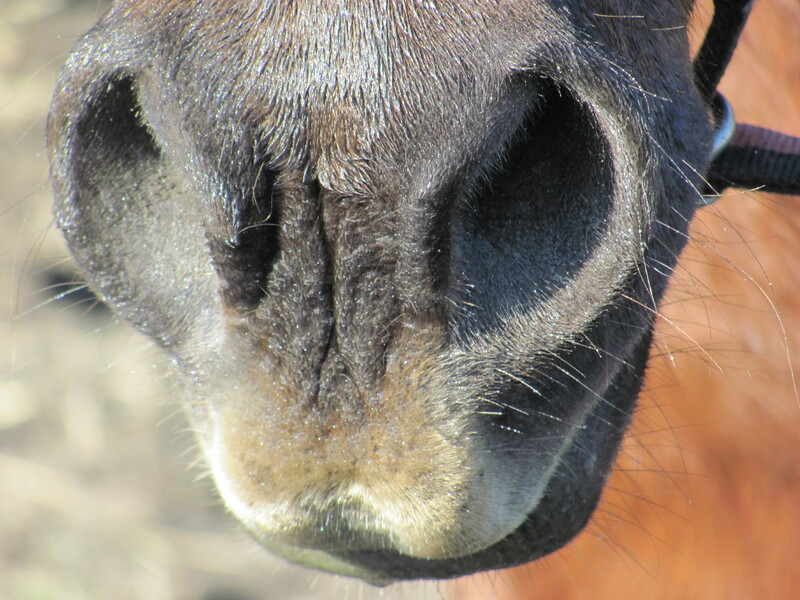 The horse’s right nostril is controlled by the left hand side of the brain – which governs the horses functions, the way it does ‘stuff’. The left hand nostril is governed by the right hand side of the brain – which is the intuitive, creative side. Much like in people. Please keep in mind that while horses and dogs respond well to aromatherapy, some essential oils are toxic to cats. Don’t forget to mention that you need to buy quality essential oils and not fragrance oils, perfume oils or nature identical oil as the latter can make your horse sick. 🙂 The better quality the oil, the better the results will be with essential oils as the plants used tend to be more potent. Yes, absolutely! It can be tempting to use perfume oils because they are less expensive but they don’t have the same benefits and can be quite harmful. I’ve also started to make my own cosmetics lately and have switched from shampoo to natural soap for my hair. Same reasons, was fed up with all the chemicals. I thought about making stuff for my horse as well. Your post is very encouraging! I noticed that my horse likes to smell the massage cream that I use for his arthritis, it contains camphor. It’s like he thinks about it. I totally came to love shea butter, too, I use it on my face after oil cleansing and it’s the best thing I’ve ever used on my skin. Thanks for sharing! I just want to share that if there’s one thing I had learned the hard way, I have to dilute first the essential oils before applying. I’ve never thought horse’s skin is way more sensitive than humans.